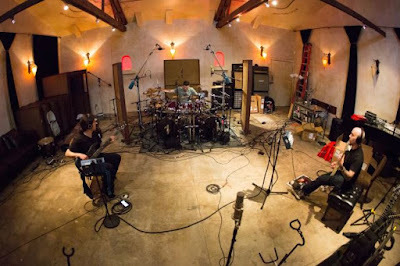 The video package sees bassist Frank Bello talking about the group’s writing and recording process, drummer Charlie Benante discussing why the new album is "the next level" for Anthrax, and guitarist Scott Ian explaining why the band recorded the 18 new songs in batches. The new album is expected to be released in early 2016. Anthrax are currently playing dates with Motorhead on that group’s 40th anniversary tour and will perform at Motorhead’s Motorboat 2015 cruise at the end of this month. In the fall, Anthrax will play Loud Park 15 in Japan, and join Slayer for a six-week European tour. Anthrax had the honor of performing the final metal show at the Sunset Strip’s House Of Blues at the end of July before it closed to make way for a new hotel/housing/retail complex.